Don’t forget that special snow skier on your list! Posted on Tuesday, December 15th, 2015 at 8:26 am. Posted on Friday, September 5th, 2014 at 1:17 pm. Like us, the ski testers at Backcountry magazine are starting to get pretty amped up for the upcoming snow ski season, and from the sounds of their review, they are also looking forward to more time on the GOODE Sorcerer carbon fiber snow skis too. Editors say that the Sorcerer “conjured up a little magic with testers” who heralded its capability in all turn shapes. 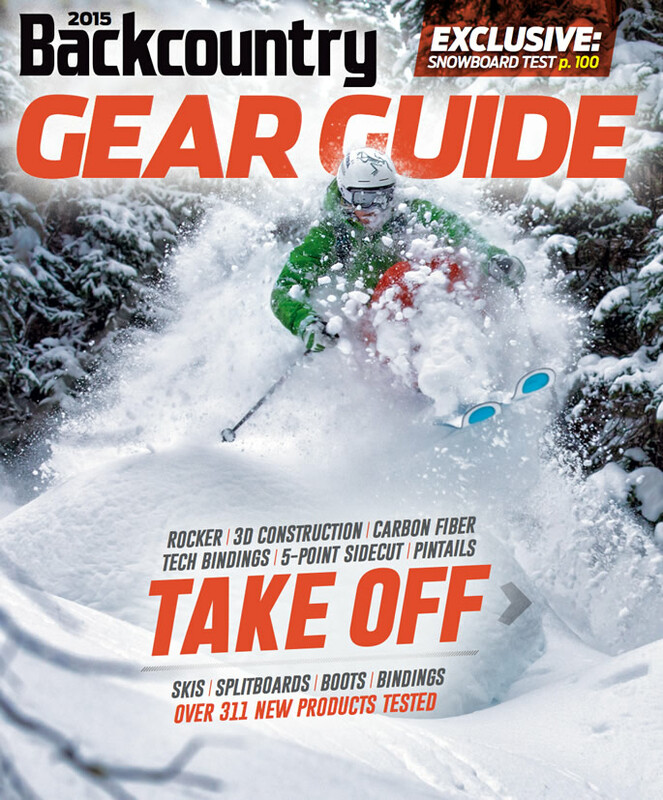 Pick up a copy of Backcountry magazine’s 2015 Gear Guide and read the full review. Posted on Monday, November 4th, 2013 at 8:12 am. For the 2014 edition of it’s annual gear guide, Skiing Magazine tested 264 snow skis. Of those, only 122 were deemed good enough to be reviewed, and thus receive an “Official Selection” designation, and a further 16 scored high enough to earn “Tester’s Choice” awards. If you know how to carve a turn, it’s hard to dislike the Fire, which is a total knife on groomers. Testers loved how it zipped from edge to edge. “Pure sweetness. This ski tears up the front side,” said one. Light, fearless at speed, and still plenty enjoyable in the bumps, trees, and crud, this Tester’s Choice is an all-mountain expert’s dream ride. See the full review here. A confidence-inspiring ride for the more traditional skier, the Sorcerer ripped when we pressured our boot tongues. Though it uses a lightweight carbon-laminate construction, it felt incredibly stable at high speed and in chundery terrain. Plus, testers scored it highest for Hard-Snow Performance among skis of similar width. It’s a perfect one-ski-quiver or narrower powder ski that will still be sporty on groomer days. See the full review here. Take a look at the additional skis in GOODE’s award-winning lineup here. Posted on Thursday, March 28th, 2013 at 11:48 am. Goode’s soon-to-be-released line of new carbon fiber race skis captured multiple top-five finishes at the USSA Masters Nationals last weekend in Big Sky, Mont. On the strength of fourth and fifth place finishes in giant slalom and super-G, respectively, Tim Itin finished third overall in the Men’s 6 division. In Women’s 7, Dawn Goode took second place in downhill, fourth in both super-G and giant slalom, and fifth overall. Dawn Goode charges Big Sky. The big results come after Dawn earned two giant slalom victories during the season-long Jan’s Cup Series and both Dave and Dawn taking second place in their respective divisions at the USSA Masters Intermountain races held at Snowbasin resort in Utah. Goode Skis is the first and only company building pure carbon fiber race skis. The skis are expected to become widely available this fall. Posted on Tuesday, February 12th, 2013 at 6:38 pm. Congratulations to Dave and Dawn Goode, who both took second place in their respective divisions at the USSA Masters Intermountain/Jan’s Cup Slalom Race held last weekend at Snowbasin resort in Utah. Dave and Dawn skied on Goode Carbon Fiber race skis and used Goode Carbon Fiber ski poles. The next scheduled USSA Masters Intermountain race will be held at Wolf Mountain, Feb. 22-24. Posted on Tuesday, December 18th, 2012 at 11:45 am. For more than 30 years, Lee Quaglia and his shop, Aspen East, have been welcoming skiers and boarders to Killington with a huge inventory of top-of-the-line products, expert technical know-how, great customer service, and for the last 20 years, GOODE carbon fiber ski poles. GOODE: Killington has been open for a few weeks, how’s the season looking so far for Aspen East? Lee: So far it’s OK. It started out very well and every two to three days we’ve seen new trails open. Killington has made a commitment to snowmaking this year that they have not done the past three or four years, so it’s really a much better early season effort. GOODE: Are the long-range forecasts calling for more snow at Killington this year? Lee: Well I think the best forecast would be to check back with me in April and I could tell you how it went. The Weather Channel and National Weather Service seem to say that we’ll have an average snow year. That would certainly be better than last year, which was the worst year I’ve seen in 40 years of doing this. GOODE: A lot of shops had tough times last year because of poor snow totals, but not many also had to deal with a tropical storm that cut you off from the rest of the world for a period of time. How did Irene impact you last year? Lee: It was a disaster in the beginning because we had no road to the west for 2-1/2 miles and to the east there was a gap of about a quarter mile, so we couldn’t have any tractor trailers or deliveries for 19 days until that opened and even then it was a single-lane, makeshift road. At first, people thought Vermont was completely closed, and then we had a resurgence around Thanksgiving. But then the season went down the drain and it really never snowed. There is nothing you can do about that. GOODE: You’ve carried GOODE carbon poles for more than 20 years now, why have you been so loyal to them? Lee: We ran into Dave Goode when he just had one or two different types of poles in the very beginning at a trade show at Stratton Mountain. I picked up the pole and I went ‘wow this is totally different than anything out there.’ Basically the pole game is either that it’s a high-end pole that only a few people buy, or it’s a down-and-dirty-pole that someone buys with a package or it’s just something they need at that moment. GOODE poles really address an overview of everybody who can appreciate the feeling and quality of a high-end pole and they last forever. Nothing ever goes wrong with them. The only reason anybody would probably buy another set is because theirs got stolen. GOODE: What are the poles’ key benefits? Lee: The No. 1 benefit, especially with the higher-end poles, is that the grip is adjustable. It goes up three or four inches, which is basically the depth of the physical grip itself. For example, if you buy a 50-inch pole, it’ll go down to 47 inches. So you spin it down to 47 inches and then you say, ‘you know it’s too short, I want it at 48 inches,’ you haven’t committed to cutting the pole. You can just thread it back up, lock it off and away you go. And especially when you go into the higher-end poles, there is a much lighter swing weight and easier throw to them. So for someone who is really a skiing purest, or is looking for something that’s certainly better than the average aluminum pole, GOODEs stand out. And because they are made of carbon, there is a flex to the shaft of the pole that really takes some of the shock you’re your elbow and arm. If you are an Eastern skier who is planting that pole over and over again on hard pack or icy conditions, anything that takes the shock out of your arm and wrists is a good thing. GOODE: What kind of feedback do you get back from customers who’ve bought GOODE poles? Lee: I think the best feedback is that they continue to buy GOODE poles and don’t switch to another brand. When they do buy a new pole, they either go for the same one they’ve had or maybe upgrade to another GOODE pole. GOODE: Your shop has really embraced internet retailing. How much of a part of the business is it for you? Lee: Here at Aspen East we have two online stores: AspenEast.com and SurftheEarthSnowboards.com. Surf the Earth is the snowboard section and Aspen East is ski. We’ve been doing this for over ten years and each year we’ve seen increases with them. It’s kept us moving forward as opposed to either just hanging on or losing market share. GOODE: From a retailer’s standpoint, what are the challenges facing the industry right now? Lee: One major challenge is the weather, because it didn’t snow in the big cities last year, Boston and New York, so out of site out of mind. You always think that if they are blowing snow the skiing is good, and that’s true if you are here locally. But if you are the guy sitting there in New York City and it’s 55 degrees, you are not getting that heads up to go skiing no matter how much advertising is being done. Also, with the immediacy of smartphones and all the new technology that is out there, people are just not committing to that two to four, six-week ahead of time reservation that they did even a few years ago. They are waiting for the optimum last minute to pull the trigger to come on a specific weekend or when they have the time off. It’s a challenge at best. GOODE: You’ve twice been named New England Shop of the Year by Skiing Magazine. What’s your secret to success? Lee: First of all we are very fortunate to be in a highly populated ski area and have a lot of people that come in and out of here, as opposed to being maybe only a very good shop without a lot of people coming in and out. We have a population base going for us. Second, we’re on the main east/west corridor of Vermont, Route 4 and Route 100 and we’re in Killington which is the major ski area centrally located in the middle of the state. It’s very easy to get here, five hours from New York, three hours from Boston. We try to offer as many things as we can to basically a higher-end person, not necessarily money wise, but someone who is committed to the sport because they are a snow lover and we understand that. Everybody who works here either skis or rides or both and they are out there five, six, seven days a week enjoying their sport. Posted on Tuesday, October 30th, 2012 at 7:03 am. GOODE is getting some major magazine love as four of its snow skis have won awards from SKI and Skiing magazines. To learn more about GOODE’s entire award winning 2012/2013 lineup, click here. Posted on Wednesday, October 24th, 2012 at 12:52 pm. The American West has been hit by a massive early season snow storm and Utah’s Wasatch Mountains are no exception. Here’s a shot taken this morning of Snowbasin, site of the 2002 Olympic Downhill and Super G, and due to its 20-mile distance from HQ, the home resort of sorts for GOODE Skis. Posted on Tuesday, January 17th, 2012 at 9:28 am. Congratulations to GOODE’s own Dave and Dawn Goode who finished second and first, respectively, in their age divisions at the last weekend’s U.S. Ski and Snowboard Association masters division race in Sun Valley, Idaho. Dave and Dawn raced on prototypes from GOODE’s soon-to-be released, all-new line of Carbon Fiber Race Skis. Posted on Wednesday, December 14th, 2011 at 5:01 pm. Continuing its tradition of innovation and performance, GOODE has released a completely redesigned lineup of skis for the 2011/2012 season that promises to have skiers feeling the pure-carbon difference. Comprised of Men’s and Women’s all-mountain, freeskiing and backcountry models, the skis are 30- to 50-percent lighter than traditional skis, but their carbon construction gives them more than double the physician properties, including strength and torsional rigidity. That combination plus advances in shaping and construction have resulted in revolutionary lineup, says Dave Goode, founder and president. The industry is seemingly in agreement as the skis are building good buzz within the skiing community. The ski line has been recognized for their performance by editors and gear testers at Ski, Freeskier and Peak magazines, among others. Among the biggest advances is the introduction of three new rocker patterns – slight, rising and strong – that make the skis easier to turn and effortless to ride. In groomed conditions, rocker allows the ski to drift slightly into the turn before the edge hooks up, while in powder it contributes to increased flotation and ease of turning. Also new for 2011/2012 is an improved ski “feel,” thanks to all-new wood cores in the alpine skis (all-mountain and freeskiing) and a Light Hellraiser™/Kevlar core in backcountry models. But perhaps the biggest change isn’t how the skis are made, but where. Earlier this year GOODE moved all of its snow ski manufacturing from China to its plant in Ogden, Utah, making it the only major snow ski manufacturer to make its skis in the United States. The move has increased the company’s ability to closely monitor construction quality, and, says Dave, made it easier to test designs in the nearby Wasatch Mountains and quickly apply them to the products. To check out the new GOODE skis, click here.